Eco-Friendly + Amazing Tech Features = Ford Fusion | Texstar Ford Lincoln Inc. 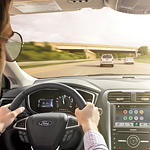 The Ford Fusion does more than interface with your phone; it turns your phone into another compatible tech feature. Using SYNC 3, Ford's infotainment system, the Fusion lets you interface with your iPhone or Android via Siri or Google, respectively. What can you do? Play Apple Music, Google Music and receive traffic information, or play hands-free calls and messages. Yes, the Fusion comes with a five-year complementary trial of SiriusXM Travel with Travel Link. Take advantage of GPS linked with 3D maps, superior turn-by-turn voice-navigation, weather and traffic info. Travel Link also delivers route-specific info, such as gas stations and prices. Swing by Texstar Ford Lincoln Inc. today to test drive a Ford Fusion and experience its handling and incredible tech for yourself.